Heat oven to 400°F. In 8-inch skillet, heat oil over medium-high heat. Pat steaks dry with paper towel; sprinkle both sides with steak seasoning. Add steaks to skillet; cook 1 to 2 minutes on each side or until browned. Remove steaks from skillet; place on plate. Place 2 biscuits on microwavable plate. Microwave on High 30 to 40 seconds, turning biscuits over halfway through microwave time, until soft enough to press into rounds. Repeat with remaining 2 biscuits. Spray cookie sheet or 13 x 9-inch baking dish with cooking spray. On cookie sheet or in baking dish, roll or press 2 of the biscuits into 5- to 6-inch rounds. Place 1 steak on center of each flattened biscuit. Press remaining 2 biscuits into 5- to 6-inch rounds; place over steaks. Flute or crimp edges with fork to seal. In small bowl, beat egg yolk and water with fork until blended; brush over top biscuits. Bake 14 to 18 minutes or until golden brown. Meanwhile, in 1-quart saucepan, mix cheese, pepper, whipping cream and Worcestershire sauce. Heat to boiling. Reduce heat to medium-low; simmer uncovered, stirring constantly, until cheese is melted. Stir in mushrooms. Keep warm over low heat. 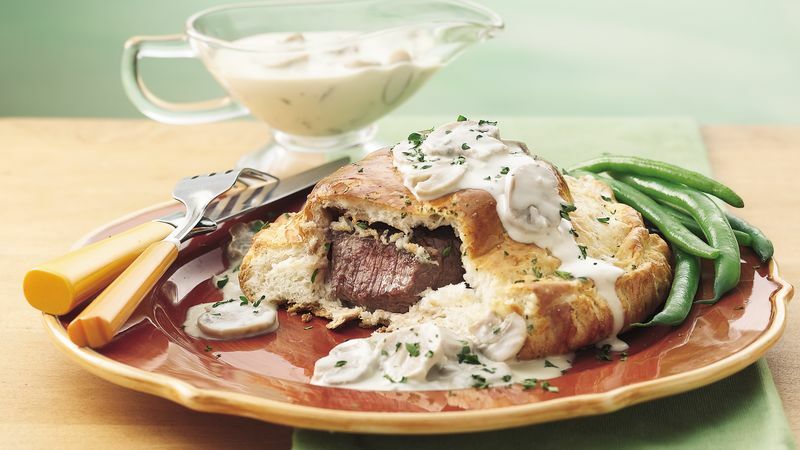 Serve half of mushroom gravy over each wrapped steak; sprinkle with parsley.